The smoky brown cockroach is similar to the more common american cockroach but is slightly smaller ranging from 3 - 3.5 cm long. It is a rich mahogany brown color, and the thorax is dark and shiny, which distinguishes it from the lighter thorax of the american cockroach. Female smoky brown cockroaches are slightly larger than males. The smoky brown likes warm, humid conditions, and as such, it is found over most of Honshu, Kyushu, and Okinawa, as well as in the southern United States. It tends to base itself in warm spots outdoors, and from there it invades buildings and houses. 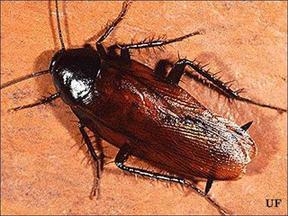 This roach needs access to liquid water every 2-3 days because it loses moisture through it's outer layer of skin. In Japan, this means that the smoky brown is not as common in houses as other types of cockroach because many houses have air conditioning, which keeps humidity levels down. Cockroaches are scavengers, eating rotting vegetation in forests, food scraps in kitchens and drains, as well as cat and dog food. They will also eat the feces of other animals. This habit, combined with their secretions of saliva, give them that uniquely unpleasant cockroach smell. This cockroach can fly well - better than the american cockroach - and is hardy (they have been around in some form for over 350 million years). It is able to survive pretty much anywhere and on anything. However, their association with dirty and unsanitary conditions does have health consequences. A study on Japanese asthma patients shows that many of them have antibodies to cockroaches -- that is, their immune system has been stimulated to attack cockroach emanations. Once smoky brown cockroaches find a suitable site, they can quickly infest it. Females produce and carry around a capsule containing about 20 eggs. The capsules hatch after an average of 45 days and females mature in about 300 days. Each female can make around seven capsules so the best way to keep numbers of smoky brown cockroaches low is to make sure they don't have places to hide outside, near your house.